Naturalization | Immigration Attorney Fort lauderdale, FL - Miami, FL Adam Franzen. P.A. Living the American Dream and becoming a United States citizen is often the greatest goal of any foreign national who has made the incredible sacrifice to live and work in America. Immigration Law is complex and requires the guidance of experienced professionals who are equipped with the knowledge necessary to fight for you. By taking an oath of commitment to America and pledging your loyalty to the U.S. Constitution, you can be rewarded with the full rights, freedoms and privileges of a true American.In order to obtain U.S. citizenship through naturalization, foreign citizens of nationals must fulfill certain requirements established by Congress in the Immigration and Nationality Act (INA). (Our website is a virtual encyclopedia of information on U.S. immigration laws and procedures.) There are also several available avenues that eligible applicants can complete. Legal avenues to permanent residency, citizenship and temporary visas are available, but only a skilled Immigration Attorney can safely navigate the bureaucratic process and ensure that your best interests are not strangled by red tape. The Law Offices of Adam Franzen, LLC, has provided excellent representation for individual and families as well as multi-national corporations for the past 10 years. Mr. Franzen is licensed to practice Immigration Law in all 50 States. The Law Firm takes pride in its integrity, honesty, hard work and its ability to find solutions to complex issues. We constantly update our knowledge base with only the most updated and relevant Immigration Laws and changes. Our Firm utilizes a sophisticated online case preparation program that allows for state of the art case proceeding, filing and client updating. Green card holders who are married to a U.S. citizen can apply for naturalization under different eligibility requirements. These requirements are having been a permanent resident for at least three (3) years, married to the same U.S. citizen spouse during that time, and other residency and physical presence requirements. U.S. immigration values the commitment of foreign nationals who serve our country in the armed forces. With that being said, members of the military forces, as well as their spouses and children, may be eligible for citizenship through an expedited immigration process. This type of naturalization may be conducted through overseas processing, if necessary. Foreign citizens may also obtain citizenship through their parents through two different ways, the first at birth and other after birth but before the age of 18. Children born outside of the U.S. may obtain citizenship if both parents were U.S. citizens at the time of birth, one parent is a U.S. citizen at the time of birth, and the birthdate is on or after November 14, 1986, or when one parent is a U.S. citizen at the time of birth and the birthday is before November 14, 1986 but after October 10, 1952. Citizenship through parents can also be awarded before the age of 18 if the child was under age 18 or not yet born on February 27, 2001 to at least one U.S. citizen parent, the child’s parents both naturalized before their 18th birthday, or the child was adopted by a U.S. citizen parent. The interview and application to become a naturalized United States citizen is filed on Form N-400. Form N-400 requires the immigrant applicant to provide specific information of the immigrant applicant’s personal history; marital and family-related information; places of employment and addresses in the United States for the preceding five years; all travel trips outside of the United States since becoming a permanent resident lasting more than six months; whether the immigrant applicant seeks a waiver of the history test at the naturalization interview; and all details of any arrest history. Form N-400 is submitted with a filing fee paid by way of check or money order to USCIS in the sum of $675.00, and two (2) passport-sized photos. The permanent resident applicant shall include copies of all required documents along with the application. Such documents shall include: a copy of the front and back of the “green card,” a copy of the birth certificate of the applicant, a passport copy of the applicant’s passport, a marriage certificate or divorce decree copy from the applicant’s (as applicable), copies of the birth certificates for the applicant’s children (if applicable), and all copies of certificates of final dispositions for any arrests that the applicant may have in the United States (if applicable). Before mailing Form N-400 the permanent resident applicant should keep for their application file the: required fee, passport photographs, and supporting documents to USCIS, including copies of passport photographs, copies of check/money order for filing fees, and supplemental documents. Additionally, it is prescribed that any and all documents being mailed by the applicant to USCIS should be mailed by certified mail/return receipt requested. 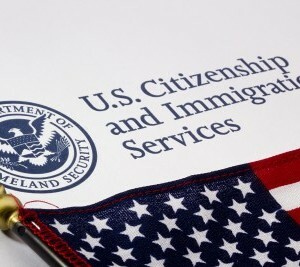 Later to receiving Form N-400, USCIS schedules the applicant to have his/her fingerprints taken, and eventually to come into a local USCIS office to be interviewed regarding the application. During the interview, the applicant (unless a waiver has been granted to elderly or infirm applicants) is required to answer ten (10) questions on United States Government and history, including specific questions to the State in which the applicant resides. The applicant must answer at least six (6) questions correctly. The examiner selects ten (10) at random questions from a list of 100 questions. The examiner also requires the applicant to write brief sentences in English, and read a short passage aloud in English. The applicant must establish to the examiner’s satisfaction that he or she has sufficient knowledge of U.S. history and Government, and is adequately fluent in the English language. Completing the naturalization process and obtaining citizenship is one of the most defining experiences for foreign nationals who have sacrificed and gone through the immigration journey. Although this process may seem difficult, you can more easily take the steps toward citizenship with the full support and assistance of an experienced Florida immigration attorney from the Law Offices of Adam Franzen, LLC. Nothing pleases us more than helping our clients reach their immigration goals, and we stop at nothing to make their dreams a reality. For more information, a free case evaluation and legal assistance, contact our firm today.